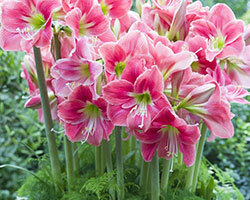 A: Provide your amaryllis with plenty of light while its blooming. As the flowers fade, remove the flower and stalk so the amaryllis does not use energy producing seeds. Place in a sunny window and allow the foliage to develop. The foliage is producing energy that will be stored in the bulb and used to fuel the next bloom cycle. Place outdoors in a spot that has morning sun and afternoon shade once all danger of frost has passed. Fertilize monthly. Before the threat of frost, bring indoors. Reduce watering and allow foliage to yellow and die back naturally. Once the leaves have browned completely, remove them and place the bulb in a cool, dark area for two to four months. After the rest period, water your amaryllis bulb and place it in a warm, sunny location. Soon your amaryllis will be blooming again. Please contact Plant Information Service at (847) 835-8362 or for more detailed information.